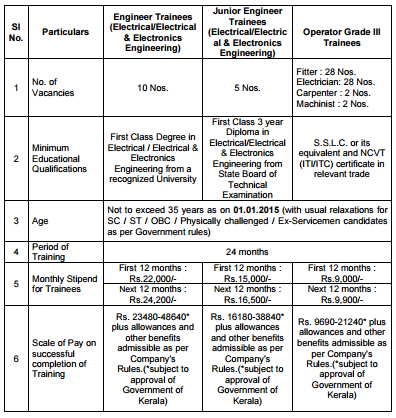 Transformers and Electricals Kerala Limited ( TELK) , a joint venture of Government of Kerala & NTPC Limited invited application 10 post for Engineering Trainees( Electrical/ Electrical & Electronics Engineering ) and 5 post for Junior Engineering Trainee ( Electrical/Electrical & Electronics Engineering ) and 60 post for Operator Grade III Trainee . Junior Engineering Trainees (Electrical/Electrical & Electronics Engineering) – 5 Nos. Service agreement for 3 year after successful completion of 2 year training.